capture as much of that genius as you can." Perhaps Docter is exaggerating but not by much... Before I launch into a short but glowing appreciation of Pixar's latest, I want to give my two cents worth on a topic that will inflame cinematic debate for many years. My review of Up - and its sumptuous blend of pitch perfect emotional tonality, glorious production design, luscious score and vocal performances that hit the nail on the head with such accuracy, it's a wonder they're not all chippies to the Crown - follows after a brief 3Detour. 2009 is really the start of what Hollywood execs hope is a revolution in cinema going – 3D. Yes, we have the über-hyped Avatar to look forward to (that would be looking forward to in three dimensions, no less – or should that be no fewer?) and a whole slew of big budget movies taking the double-lens plunge but my question is this. Emotionally, will we care more if it's in 3D or 2D? Let the debate rage. For my views on Up you'll have to scroll down a little (past the second horizontal line) but I feel strongly that the 3D debate is worth a mention and what better time than when the baby's halfway down the birth canal? September 2009 – The Jackson Hole Wildlife Film Festival. As an editing peer judge, workshop leader, debate moderator and delegate at the festival, I'd already seen most of the films. The workshops and seminars I was interested in most were those exclusively dealing with 3D and what might its impact be on the whole industry. When you are being told over and over again how this process will revolutionise the business, the least you can do is get informed. My friend and producer of the last resolutely 2D feature I made said that all TV and movies in 10 years time will be shot and screened in 3D, in cinemas and in the home. I allowed myself some expectation and dare I say excitement. I learned the basics including how you can take two side-by-side stills and process them so they can be viewed in 3D using Photoshop (and wearing a pair of frankly archaic, silly red and green glasses). I saw a few 3D movies, big budget studio films, made-in-the-field IMAX and heavily CGI'ed efforts and came to the queasy conclusion that the gimmick status had by no means been removed from the experience. There was a huge Panasonic truck parked in the lot outside the lodge and inside you leaned on roll bars rather than sat down ("It's that immersive!" we were told). We then watched loving sweeps over CG 3D racing cars, some skiers jumping into frame from over our heads and some more material that showed off the technology. Finally, the trailer of Ferngully III (sorry, Avatar) came on and I was as non-plussed seeing it in 3D as I was seeing it in 2D. All three of us came out of the lorry smiling at the salesman (ever polite) and agreeing together in private that it really wasn't the revolution we were told it would be. In fact it was a pain in the eyes if it wasn't done well and the polarised glasses were not put on and forgotten about. Even watching an emotionally 'immersive' film such as Up, I still took the glasses off a few times just for a break. Who wants a break in a movie unless it's four hours long? We're dreaming someone else's dream. Who wants to be woken up? The simple fact is that like most new technology, 3D takes us forward at the expense of dragging us back during the transition. Digital photography, in the first few years, robbed us of the ability of taking the snaps exactly when we wanted to not when the camera decided because of the speed (or lack thereof) of the picture information's trip to the memory stick. The best example I could come up with (and I put this to the main 3D chap behind the successful IMAX 3D, Bugs 3D short movie) is that we are in a virtual 1927. Something significant happened to cinema in 1927 that tore the wondrous creativity out of the craft and had it back pedalling for at least a decade. Look what silent film-makers were doing at the time; Griffith, Murnau, Chaplin, Keaton. German expressionism was peaking (and a grocer's son from London was keeping close tabs on that). The latter (a certain Alfred Hitchcock) made the transition to sound relatively effortlessly. He didn't see the enormous and almost immovable cameras as a problem. He simply saw sound as an opportunity. But nevertheless, the industry was transformed and audiences demanded sound be added to their pictures. There's the rub. Sound came naturally to pictures in the way that sound is part of the reality of our real world. Now the extension of this argument is that 3D must come next – yes but only if 2D is unsatisfying up against 3D in the same way that silent will always be unsatisfying up against sound. I'm not putting silent movies on a lower level than 'talkies' but as a mass medium, the addition of sound to movies was more than inevitable in hindsight. That's a huge sentence - which is why we need to pause. The end of cinema as I have known it. Oh. Perhaps this incredibly depressing thought is colouring my judgement of 3D? 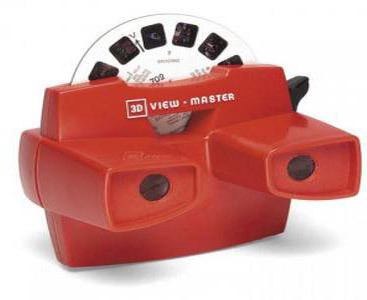 How many people do you know pass you a Viewmaster 3D Stereo Viewer to see their holiday snaps? 3D has been with us for almost a hundred years and we've still not folded it into our everyday entertainments and distractions. Yes, better technology has upped the process and Avatar is leading a charge of sorts but Laurel and Hardy were still funny in black and white (and silent, and 2D). I somehow think that we are all missing the point. 3D isn't something we have all been waiting for. It's a process to combat online piracy, a flare gun sent into the heavens due to the emergency of falling cinema attendance and naughty in-cinema camera recordings. All I want to do is care and I can care watching 2D as much (perhaps more) as I can watching 3D. Do me a favour and watch It's A Wonderful Life. Cry at the end? How about your tears shed in the Pharmacist scene when George realises the old man has screwed up the prescription due to grief? How markedly different would your tears be if Capra's masterpiece was in colour? Better still, how more rounded would those tears be if George ran through Bedford Falls in three dimensions? So, to Pixar's outstanding and rewarding treatise on love, grief and a cure for the latter, adventure – how about those as appropriate subjects for a kiddie flick? I will not go through the plot in any detail as detail is Pixar's gift to narrative and should be truffled out for yourself. But any children's movie that communicates a miscarriage or inability to have children within the first few minutes ups the ante in such a way that the thousands of movie hacks at the opening of the Cannes Film Festival were right to be snivelling into their tissues. These are big, important issues, life and death, loss and love. And over these revelations, hardly a word was spoken. Compare this exquisite cinematic sleight of hand with the ham-fisted opening of Gervais' The Invention Of Lying. "Let's just do a voiceover and tell 'em! Bye, cinema!" Just in case you think I'm being unfair, let me suggest a better way to open Gervais's high concept comedy. Start with a selection of scenic shots of the city with small advertising boards that are not front and centre but pull your eye in because of what they say; "Buy this product because our jobs depend on it" or (to take a real example from the film) "Pepsi! When you can't buy Coke." People in the cinema already know the movie is about a world of habitual truth-tellers. Why not tell us visually and let us slowly find all this out, even be surprised and shocked and amused by all this. But no. It's announced upfront so the humour is concentrated into its shock value rather than the slow burn. If Pixar are masters of anything, it's that slow realisation of the wonderful pay offs of all the signposts. To be the tiniest bit critical (dare I?) there was one signpost that was a little too loud in the early moments. I'll just say 'badge' and let you figure it out. Yes, it's a Disney-Pixar children's film but why not take on the weighty while you still deliver the outrageous action that passes as de rigueur in animation these days? How they claim the high ground on the best of both worlds is a skill still unseen in mainstream Hollywood outside of John Lassiter's remit. The only negatives in the mostly glowing reviews I've read is a sniff at the shift from emotional complexity to wild aerial antics and chases which, so it's said, undercut the former. I see it more in the sense that this is a Pixar children's film and as such it has to deliver certain core elements. It's trapped inside a formula it helped to redefine. But that it does it with such wit with the occasional lurch into eccentric and wildly imaginative action is like complaining about a lover's perfect body because they have a mole on their hip. Love the mole, eschew perfection, embrace the real! Gruff old Carl Frederickson has lost his beloved wife, Ellie. Childless, all he has is a home stuffed with memories and reminders of a life he used to live. His house stands in the middle of a vast building site, presumably the only dwelling that's stopping developers from taking over his land. He stands firm. And another first for a mainstream animated children's film – blood. Carl shed a little (not his own) defending his house and is suddenly gripped by an outrageous idea. Well, it's no secret that the idea is to fly his house to Paradise Falls in South America where his wife and he had always planned to visit. 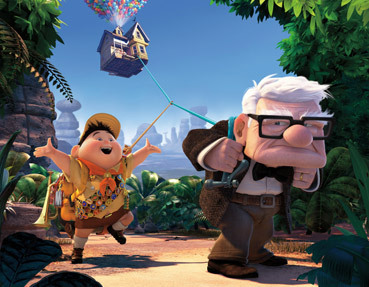 Pixar have laid many a signpost and as Carl is an ex-helium balloon salesman, he uses hundreds of thousands of them to lift his house clear from the ground and heads to the skies to start his adventure; one small uniformed problem; a cub scout (or the US equivalent) on his doorstep now at 3,000 feet and climbing. It's extraordinary what outrageous ideas the film-makers can get away with, so firmly have they planted Carl's grief in our minds. It's like they have paid the licence to go anywhere and do anything (which is fairly accurate) but as long as we stay with Carl's impending redemption, we stay with him and the film. There are stand out performances by the three leads (Ed Asner as Carl, Jordan Nagai as Russell and Christopher Plummer as the villain Charles Muntz) and of course Cheers's postman Cliffy turns up as a Pixar good luck charm playing one of the foremen on the site. The design of the movie takes your breath away in some instances and the animation – is it even worth me saying how flawless it is? Michael Giacchino's score is heartfelt and has a main theme I ended up humming and the writing is razor blade sharp finding value in the real rather than the 'wish' or the imaginary. Russell complains to Carl that this isn't what he thought it would be like at all (having received his 2nd hand experience of South America from books one imagines). Carl replies "Get used to it, kid..." Cynicism? No. Finding real meaning in the real thing over the imagined. That's it.